Haute Whimsy: For the Love of "The Walking Dead"
For the Love of "The Walking Dead"
I just had the most lovely, lazy weekend! 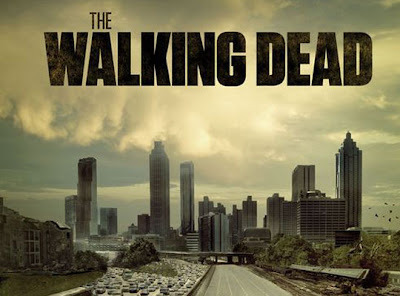 I spent Friday night starting The Walking Dead series and was instantly hooked. I then spent most of Saturday finishing the series (while eating wonderful fondue with pears and apples), which meant that I was able to watch tonight's new episode in real time with my boyfriend. Wow, what an incredible show! The character development is top notch and I've fallen in love with a few of the people along the way. My favorite, so far, is Daryl - he's about as happy making as they come. He was also in The Boondock Saints, which is a swoon-worthy plus in my book (my friend and I snuck a bottle of wine into the theatre and watched gorgeous Irish boys on the big screen when they re-released the movie a few years ago)! Do you watch The Walking Dead? If so, who is your favorite character? If you don't watch but would like to catch up, you can order season 1 and season 2 on DVD! Ooooh! I ADORE The Walking Dead! A good friend of mine and I used to watch it together back home, and now my flatmate and I watch it together. I am absolutely, head over heals in love with Daryl LOL. We just finished season two! LOVE it. Although I yell at the screen a lot. Daryl is by far my favorite and I've never hated a tv character more than I hate Shane. We watch on netflix. I'm having withdrawl.....can't wait for the rest of it! Yeah, Shane is awful! I tried to give him the benefit of the doubt ... you know, world in chaos and all, but he just got worse and worse!